The abacus has taken many forms over the centuries. In Medieval and Renaissance Europe, merchants commonly did calculating by moving wooden or metal counters along lines drawn on a wooden table known as counting board, a counter-board, or a reckoning-board. The term “counter” eventually came to refer not only to an object used in calculations but also to the place in a store where transactions are carried out. Examples of counters made in Germany in the seventeenth century are in the Smithsonian’s National Numismatics Collections. In the nineteenth and twentieth century, Asian government officials and scholars who visited the United States sometimes brought abaci as gifts. Some of these presents made their way into the Smithsonian collections. Universities and museums also acquired abaci for their exhibitions. American travelers also acquired them as souvenirs of trips abroad. Some Asian-Americans also used abaci in commerce. Special forms of abacus were made for the blind, both in Japan and in the US. 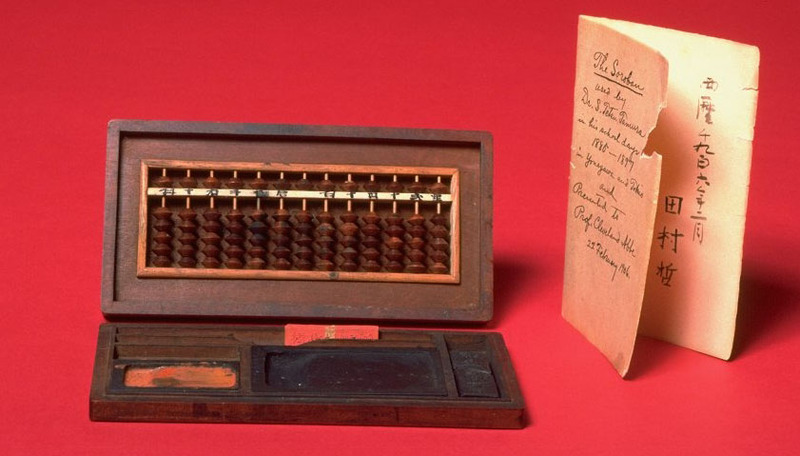 The abacus has now been largely superseded by the electronic calculator.